ROME, Sept 12 – Thailand and Italy have expressed optimism that the formation of the ASEAN Committee in Rome (ACR) would enhance the relationship and cooperation between the Southeast Asian region and the southern European country. 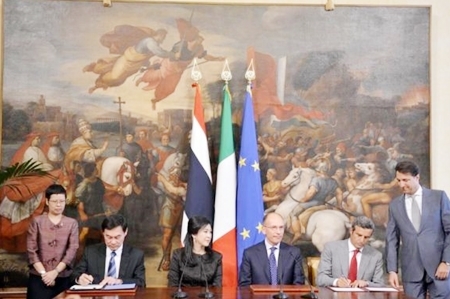 The issue was discussed in a meeting between Thai Prime Minister Yingluck Shinawatra and her Italian counterpart Enrico Letta during which they also talked about an initiative to link 10 member countries of the Association of Southeast Asian Nations (ASEAN) and partners of the Free Trade Agreement (FTA) which include Australia, China, India, Japan, South Korea and New Zealand. Ms Yingluck said the initiative, Regional Comprehensive Economic Partnership (RCEP), would also benefit Italy, if negotiated successfully. It would create the world’s largest trading bloc. The Thai prime minister expressed her appreciation to Italy for hosting the 10th Asia-European Meeting (ASEM) in Milan on October 9-10 next year. Ms Yingluck emphasised Thailand’s determination to promote economic, trade and investment development and strengthen relationship in various aspects, including anti-human trafficking. She said Thailand, in its capacity as a member of the Human Rights Council, has given importance to human rights and people’s fundamental rights. Leaders of the two countries also witnessed the signing of three memorandums of understanding on developing small- and medium-sized enterprises, cooperation between the Thailand’s Board of Investment and the Italian Institute for Foreign Trade, and military cooperation.